A team led by Shree K. Nayar, T.C. Chang Professor of Computer Science at Columbia Engineering, has developed a novel sheet camera that can be wrapped around everyday objects to capture images that cannot be taken with one or more conventional cameras. The Columbia team, which includes research engineer Daniel Sims BS'14 and postdoctoral researcher Yonghao Yue, designed and fabricated a flexible lens array that adapts its optical properties when the sheet camera is bent. This optical adaptation enables the sheet camera to produce high quality images over a wide range of sheet deformations. Sims will present the work at the International Conference on Computational Photography (ICCP) at Northwestern University in Evanston, IL, May 13 to 15. "Cameras today capture the world from essentially a single point in space," says Nayar. "While the camera industry has made remarkable progress in shrinking the camera to a tiny device with ever increasing imaging quality, we are exploring a radically different approach to imaging. We believe there are numerous applications for cameras that are large in format but very thin and highly flexible." The new "flex-cam" requires two technologies—a flexible detector array and a thin optical system that can project a high quality image on the array. One approach would be to attach a rigid lens with fixed focal length to each detector on the flexible array. In this case, however, bending the camera would result in "gaps" between the fields of views of adjacent lenses. This would cause the captured image to have missing information, or appear "aliased." To solve this problem, the Columbia Engineering team developed an adaptive lens array made of elastic material that enables the focal length of each lens in the sheet camera to vary with the local curvature of the sheet in a way that mitigates aliasing in the captured images. This inherent optical adaptation of the lens is passive, avoiding the use of complex mechanical or electrical mechanisms to independently control each lens of the array. The researchers arrived at their passively adaptive lens array by optimizing its geometry and material properties. 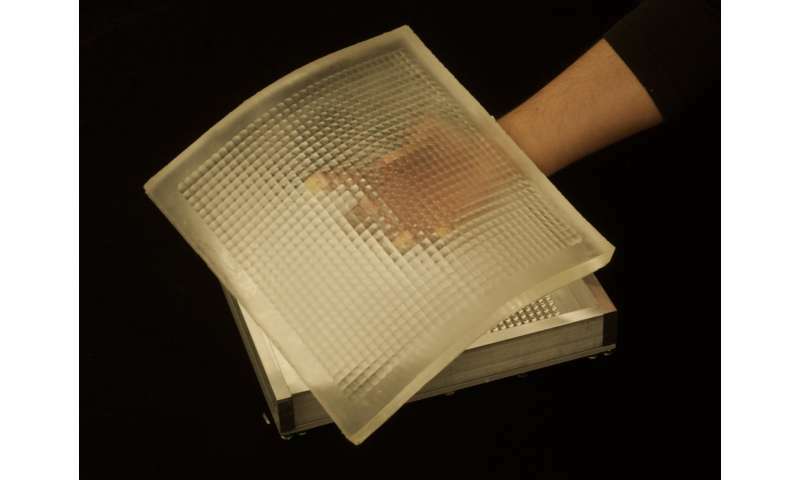 They fabricated their prototype lens array using silicone and demonstrated its ability to produce high image quality over a wide range of deformations of the sheet camera. The research was conducted in Nayar's Computer Vision Laboratory and was funded by the Office of Naval Research. "The adaptive lens array we have developed is an important step towards making the concept of flexible sheet cameras viable," Nayar says. "The next step will be to develop large-format detector arrays to go with the deformable lens array. The amalgamation of the two technologies will lay the foundation for a new class of cameras that expand the range of applications that benefit from imaging."